Steve Smith of Time Out New York has started a blog. A man with all-devouring ears, Steve has already waxed intelligently enthusiastic about Charles Wuorinen, Robert Ashley, Peter Mennin, and electric Miles. He's criticism without politics. In the New Yorker's seventy-year history, eight people have written the column Musical Events: Robert A. Simon (1925-1948), Philip Hamburger (1948-49), Douglas Watt (1950-53), Winthrop Sergeant (1953-1972), Andrew Porter (1972-92), Nicholas Kenyon (periodically 1980-82), Paul Griffiths (1992-96), and yo. I've been going through old editions of the column on the New Yorker DVD edition. I know Sergeant and Porter from bound collections; Simon is new to me. One of his pieces, from February, 1926, begins: "Enter into the conductorial arena Otto Klemperer, the seven foot dynamo from Wiesbaden, the terror of second trombonists, the cave man who yanks 'em by the collar and shakes sweet music from their quivering instruments, the wild bull of the symphony, Brann the Iconoclast, and all the rest of it.... [we] hope we're not shooing you away from his concerts, for he's worth hearing and seeing." There follows a report on an International Composers' Guild concert that included the premiere of William Grant Still's Levee Land (not named), in which Harlem theater star Florence Mills delivered the solos. Simon doesn't get the bluesy grandeur of the piece, chiding Still for ruining "mellifluous jazz" with "modern music" touches. The column ends with a note on the "fascinating Edna Kellogg," singing Jerome Kern. Simon's breezy, irreverent tone was typical of conversation around classical music in the twenties and thirties. The critic often zig-zagged among classical, jazz, and popular song. He took a break from journalism in the late twenties to pursue a career on Broadway: he wrote lyrics for Ups-a-Daisy, The Gang's All Here, Hold Your Horses, and Champagne, Sec. You'll be happy to hear I'm working on my own Broadway show, Zemlinsky in Larchmont. First number: "One Cannot Find Even a Good Glass of Coffee." By the way, Paul Griffiths's new Penguin Companion to Classical Music is as successful an attempt at a one-man, one-volume music encyclopedia as you could hope for. Hey kids, come and get that scary modern music! Saturday night, Christopher Taylor plays Ligeti's ecstatic and demonic Etudes at Miller Theatre. Sunday, the International Contemporary Ensemble gives the last of a series of performances of Peter Maxwell Davies's Eight Songs for a Mad King (in a production "drawing inspiration from 'videocam diary' culture"). Monday, remember River Phoenix. Tuesday, the Chamber Music Society presents two bone-chilling late Shostakovich works, the Seven Romances on Poems of Alexander Blok and the Viola Sonata. Wednesday, Philip Glass's Eightieth Symphony — no, sorry, Eighth — chugs into BAM. Thursday, Gidon Kremer, whose new ECM recording of Bach's Sonatas and Partitas is extraordinary, delves into Schnittke's Concerto Grosso No. 5 at the Philharmonic. Or, if you want something a little less fraught, New York Times critic Anthony Tommasini accompanies Nancy Armstrong in songs by the excellent Boston-based composer Scott Wheeler. A major event on Friday, Nov. 4: the fearless Flux Quartet plays the string quartets of Giacinto Scelsi, one of the masters of the late twentieth century. Same night, the Chicago Symphony plays this week's new Elliott Carter composition. And, Sunday after next, the Meredith Monk marathon at Zankel brings together Monk herself, Alarm Will Sound, Bang on a Can All-Stars, Bruce Brubaker and Ursula Oppens, the Pacific Mozart Ensemble, DJ Spooky, John Zorn, Zeena Parkins, and a certain Björk. Here are scattered notes on recent concerts, of use to unknown persons. 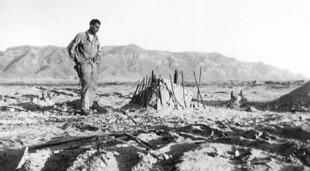 Oct. 20: Christopher Maltman at Zankel Hall. I first encountered this vibrant baritone singing Britten's Fourth Canticle with Ian Bostridge in London. Here he wasn't in best voice — he hit a dry patch in Mahler's Rückert Lieder — but a ringing declamation of "Um Mitternacht" saved the day. If Gerald Finley tires of singing Oppenheimer, Maltman could take over. Oct. 21: Così fan tutte at the Met. In a fine cast, the standout was Mariusz Kwiecien, as Guglielmo. He has liquid legato, superb diction, charm to burn. Terfelesque. Oct. 23: Royal Stockholm Philharmonic at Carnegie. What I liked most about Alan Gilbert's confident handling of the Prokofiev Fifth was that he brought out the quality of instability, the hint of terror, that lurks in the music right at the end. Oct. 25: Caught the first part of the Two Sides Sounding recital at St. Peter's, then the last part of Youssou N'Dour at Zankel. Corey Dargel's Condoleezza Rice song cycle — setting three passages from the Secretary of State's speeches — sounded prankish in concept, but was surprisingly moving in execution; the prosody was immaculate, the accompaniment achieved a certain Handelian grandeur. I recommend these songs to sopranos of daring. More on the joy-bringing Youssou another time. Via TMFTML, an aria about glaucoma; via Jon Bernhardt, cutesy twins who sing à la Skrewdriver about Rudolf Hess. From a New York Times article of April 16, 1943: "MUSIC STUDENTS WIELD THE BATON ... Yesterday was the day of days — for this year — at the High School of Music and Art. It was the fifth annual concert of original compositions by the school's budding geniuses.... 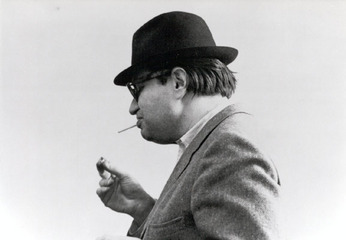 The composition, 'Dirge,' scored for orchestra, found the composer Morton Feldman, 17, in a mellow mood. 'This work is in memory of Thomas Wolfe, my favorite novelist,' said he." He stayed mellow. The manuscript of Dirge can be found in the Sacher archives in Basle. I wonder what it sounds like? Perhaps something for Mode's Feldman edition to look into. The program also included Spanish Dances by "Alan Blank," who must be Allan Blank, an overlooked master craftsman among American composers. His clarinet trio Links, recorded by Centaur some years ago, is a piece I return to often. Two others from this group went on to have distinguished careers: Manus Sasonkin and composer-conductor Charles Schiff. Drew McManus and Molly Sheridan at NewMusicBox note that the Milwaukee Symphony is offering live performances on iTunes — including the premiere of Roberto Sierra's Third Symphony, which took place in September. It's a great thing, first, that a new work can move into circulation so soon after its premiere. (Sierra's piece is a vibrant fantasy on salsa themes. Tom Strini tells more.) It's also great that an orchestra has figured out how to put recordings on the Internet. For some years, union requirements for advance payments have made recording financially unviable. Milwaukee has capitalized on an Internet policy that was set forth five years ago by the American Federation of Musicians, but which no other orchestra has acted upon; they've fashioned a revenue-sharing agreement among musicians, conductors, soloists, and publishers. That agreement should become a model for orchestras across the country. Notice, though, that in the comments section of Drew's blog some musicians have raised doubts about the Milwaukee plan; one says that revenues will be minimal, and that musicians will therefore "give away their compensation for the recordings." Minimal's better than nothing, right? Most orchestras are getting no compensation for recordings because no recordings are taking place. This is progress. You can find the MP3s by searching for "Milwaukee Symphony" in iTunes Store. Peter Garbes's fantasy football team Hans Pfitzner Blues Explosion is handily crushing its opponents, thanks to the solid quarterbacking of Drew Bledsoe. New England noise-mongers might be interested in checking out a Toy Piano Festival and Symposium that's being held on Nov. 3 and 4 at Clark University in Worcester. Thus spake the press release: "The compositions range from a microtonal / related-complex-tempo-structures tape piece built from toy piano samples to an extended free improvisation by Steven Drury's Callithumpian Consort with an 'extensible' toy piano instrument (a computer-assisted, post-prepared-piano noise-maker). 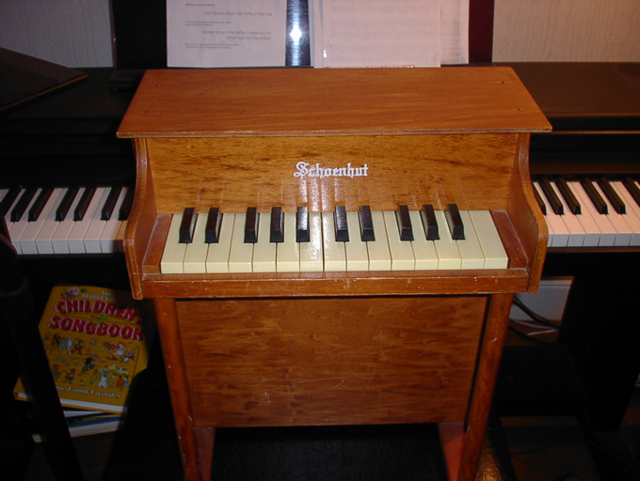 Music will be performed using laptop computers as instruments, and computers will be used to process live-performed toy piano. Symposium presentations are divided into two sessions: 'listening' and 'composing/performing.' The listening topics include a discussion of Milton Babbitt's and John Cage's writing in the context of Frederick Hollander's toy ballet from Dr. Seuss's film The 5000 Fingers of Dr. T., a narratological analysis of Radiohead's 'Idioteque', and a theoretical account of listening to 'ubiquitous' music. In the second category, there are talks on German techno-chameleon Uwe Schmidt, 'networked performance blogs' and a recent public space installation. Kyle Gann, composer and music critic from The Village Voice, will deliver the keynote address, 'The Toy Piano in the Post-Prohibitive Age,' on Saturday, November 5 at 7 p.m." I haven't encountered this many scare-quotes since David Spade was on Saturday Night Live, but it all sounds cool. What, though, is a clownsilly? A sharp and funny appreciation of Thomas Adès by Tears of a Clownsilly, the composer-blogger who created the already legendary Which Major Work of Alban Berg Are You? quiz. He relates that when he returned an Adès CD to the library he said to the librarian "This guy knows what he's doing" — inadvertently pointing not at the CD but at a copy of Paul Reiser's Babyhood. A confirmed eclectic, he also speaks in praise of Guided By Voices, bemoans the psychoanalyzing of Benjamin Britten, and writes an ode to New Jersey Guidos. I noted some months ago, in an incisive bit of inside-the-Beltway reporting that was only belatedly picked up by the mainstream media, that Tom DeLay's alleged passion for opera did not bode well for his political future. Then the Washington Post revealed that Harriet Miers, the lavishly overqualified Supreme Court nominee, likes to go to the opera with "Condi and the other single girls." Now we have this tidbit from Robert Bork: "It is said that at La Scala an exhausted tenor, after responding to repeated cries of 'Encore,' said he could not go on. A man rose in the audience to say, 'You'll keep singing until you get it right.' That man should be our model." Too bad Washington Opera doesn't have on an up-to-date production of Götterdämmerung for all these opera buffs to enjoy. It does have Rheingold coming up in March — the one in which the gods finance selfish schemes by bilking others. Speaking of operatic Condi, Corey Dargel has written a song cycle based on the Secretary of State's speeches, which Eleanor Taylor and Jocelyn Dueck will perform at Saint Peter's on Oct. 25. Photo credit: Harris County Sheriff's Office. Sasha has won the Village Voice's coveted Best Blog by a New Yorker Writer award. Obviously, the rest of us New Yorker writer-bloggers can't help feeling a little disappointed, but it's an honor just to be pluralized. Check it out, we're in Iowa! In the summer. It is fall now. Come back to work — and life. The New Yorker, Oct. 24, 2005. Don’t blame City Opera for falling short of its populist mission. The politics of Lincoln Center, where the company moved in 1966, killed that dream. The new complex had two large-scale theatres: the Metropolitan Opera House and the New York State Theatre. The second was designed for New York City Ballet, but another tenant was needed to fill out the season. If City Opera had not used the space, Martin Sokol explains in his history of the house, the Met would probably have started a secondary company, driving it out of business. So City Opera had little choice but to move in, and, once it did, ticket prices shot up. Many great things have happened at the State Theatre since—Beverly Sills’s bel-canto tours de force, Christopher Keene’s explorations of modernist music drama, recent art-diva turns by Lorraine Hunt Lieberson and Lauren Flanigan—but the house has never found an identity as strong as the one that LaGuardia and other city leaders forged. At the start of this season, City Opera made a gesture toward returning to its roots. It presented two shows under the slogan “Opera-for-All,” with every ticket priced at twenty-five dollars. One show featured the opera-friendly pop star Rufus Wainwright alongside City Opera regulars; the other offered “Madama Butterfly.” The people came: both shows sold out. How the company could permanently cut prices across the board without running a catastrophic deficit is difficult to imagine, but one thing seems fairly certain: a twenty-five-dollar-a-seat opera house wouldn’t have to work very hard to sell out. Since 1996, City Opera has been led by Paul Kellogg, a courtly and canny administrator. Kellogg recently announced that he will retire at the end of next season. Now sixty-eight, he says that he lacks the energy to keep working fifteen-hour days, much of it spent on fund-raising and marketing. He may also be weary of the city politics in which the company became embroiled three years ago, after it bid to join an arts center at Ground Zero. That plan came to nothing, along with most high hopes for the site. City Opera is still looking to build its own house, perhaps on Amsterdam Avenue near Juilliard. The Ground Zero setback aside, the Kellogg era at City Opera has been stable and successful—a model balancing act. Productions have followed a sensible formula, breaking down into approximately five categories: stagings of Handel and other Baroque operas, wavering between wit and camp; mildly revisionist productions of Mozart, Rossini, Verdi, and Puccini, with young, gifted, good-looking American singers (Rossini’s “Il Viaggio a Reims” was a hit this fall); offbeat twentieth-century fare (Strauss’s “Capriccio,” Paul Dukas’s “Ariane et Barbe-Bleue,” and Richard Rodney Bennett’s “The Mines of Sulphur”); new opera of the not too demanding sort (Rachel Portman’s “The Little Prince” arrives in November); and stylish incursions into operetta and musical theatre (Gilbert and Sullivan’s “Patience,” this fall). “Il Viaggio a Reims” is the last and possibly the giddiest of Rossini’s Italian comedies. It depicts onstage the very occasion that it was commissioned to honor: the coronation of Charles X, in 1825, and the gathering of international notables to celebrate it. (Picture, if you will, a contemporary opera commissioned for a Presidential inauguration and set at the Inaugural Ball.) Allen Moyer’s sets evoked a goofy but stylish imperial spa, and James Robinson supplied fluid direction. The female leads—Cheryl Evans, Heather Buck, Allyson McHardy, and Maria Kanyova—were at the heart of the action, working hard to master Rossini’s florid style and enjoying themselves immensely in the process. Javier Abreu stood out among the men, with his richly ringing tenor. George Manahan, City Opera’s music director, led a performance of self-effacing excellence; the orchestra is a much sharper unit than it was a decade ago. City Opera has done well by the operas of Richard Strauss in the past; in 1999, it presented a riveting production of “Intermezzo,” with Flanigan tearing into the role of a famous German musician’s wife. Last year, though, it put on a maddeningly grim version of Strauss’s “Daphne,” and the new “Capriccio” was even grimmer. The work is Strauss’s farewell to opera, a sublimely selfconscious meditation on the nature of the art. It was first heard in Nazi Germany, in 1942, a fact that the director, Stephen Lawless, did not let us forget. George Mosley, who sang the role of the Count, had to imitate Hitler’s oratorical gestures, and a bust of Gluck in one scene looked like the one that Goebbels sent to Strauss for his birthday. The sets were at once dour and tacky; we came to terms with the German past by staring at ugly furniture. Pamela Armstrong didn’t have the right soprano gleam for the central role of the Countess, but she lent warmth to a chilly show. Eric Halfvarson, as the director La Roche, ignored the “context” and revelled in the gruff, wise personality of his character. The notion of reviving “Ariane et Barbe-Bleue” was lovely on paper. This is an opera that the Met is unlikely to revisit, unless Plácido Domingo embarks upon a new career as a French soprano. “Ariane,” first heard in 1907, tells the tale of Bluebeard and his dungeon of wives, but, unlike so many early-twentieth-century works, including Bartók’s “Bluebeard’s Castle,” it allows its female protagonist a measure of freedom; Ariane, the sixth wife, walks free in the end, having tried and failed to liberate the others. The score takes off from Debussy’s “Pelléas et Mélisande”—the libretto is by Maurice Maeterlinck, the poet of “Pelléas”—but it finds an opulent sound-world all its own. It interested composers as various as Strauss (who conducted it in 1935), Puccini (the opening notes of “Turandot” can be heard here), and Dukas’s devoted student Olivier Messiaen (who admired the synesthetic color-coding of harmonies). Alas, the performance marched along where it should have glided. Leon Botstein conducted at too unvarying a tempo, and Renate Behle was miscast as Ariane; she sounded like Isolde with a power drill. However the productions turn out, it’s satisfying to watch the progress of City Opera’s singers, some of whom are still making their way through the early stages of an opera career. One is Carla Thelen Hanson, who had taken several years off to start a family. She came to the house last year as a cover singer, and got a quick promotion to Tosca: her dark-grained, strongly felt “Vissi d’arte” sailed right up to the uppermost balcony, where I was sitting. The role of Bluebeard in Dukas’s opera is actually a small one, but Ethan Herschenfeld made the most of it, giving a sharp portrait of a dark, wounded spirit. And Kevin Burdette, playing the self-infatuated poet Archibald in “Patience,” showed off his plummy, Thomas Hampson-like voice—was he doing an impersonation, perchance?—and also his phenomenal agility. He held his own in a giddy song-and-dance routine with the West End veteran Michael Ball. I’m told that Burdette is deciding between a career in opera and law. As James Joyce’s wife once said of her husband, he should stick to the singing. There has never been a TV show better than The Wire. 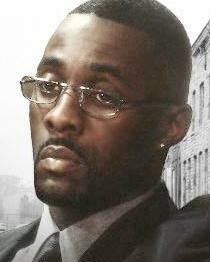 Idris Elba's ice-cool performance as Baltimore drug mogul Stringer Bell deserves comparison with Al Pacino's Michael Corleone. Don't look at the HBO site too closely if you intend to watch the series; it gives too much away. You have to start at the beginning, and you can't expect to understand what's going on at first. The Wire drives home Steven Johnson's thesis about the unacknowledged complexity of the best American pop culture. The show is complex because it's as true to life as art can be. The moment locked in my mind: Det. McNulty holding a collectible edition of Adam Smith's Wealth of Nations, saying "Who have I been chasing here?" Kyle Gann reminds me that the amazing UbuWeb resource is up and running once again. I'm listening now to Satie's beautifully boring Furniture Music. Happy seventieth birthday to La Monte Young tomorrow. It's a very dreary day in New York City, but, all things considered, it's good to be alive. Musically alert New Yorkers will have noticed that Symphony Space has beefed up its musical programming lately, with a bent for the new. Jenny Lin gives a recital Thursday night entitled The 11th Finger, featuring several of Ligeti's Etudes — much in the air these days, with a complete cycle by Christopher Taylor forthcoming at Miller Theatre on Oct. 29 — together with James Tenney's Chromatic Canon, Claude Vivier's Shiraz, Randy Nordschow's Detail of Beethoven's Hair, and a new piece entitled pAt by the aggresive young Irish composer Donnacha Dennehy ("There is a whiff of high-class vandalism about my work"). Also, percussionist-composer Jim Pugliese has written a new work for the occasion. Lin recently released a formidable disc of early twentieth-century Russian-Soviet piano music, the highlight of which were the eerie and powerful Preludes of the obscure mystic composer Nicolas Obouhov. As Nicolas Slonimsky unforgettably recounted, Obouhov used his own blood as ink on certain pages of his scores. Will we ever hear his purported masterpiece Le Livre de vie, excerpts of which Koussevitzky once conducted in Paris? In any case, Lin's site has audio samples and scores of various pieces she's played. I don't know if I have any readers in or around Allentown, Pennsylvania, but I've been forwarded a notice of an event that sounds intriguing: "Two of Juilliard's most innovative young graduates, keyboardist Cameron Carpenter and dancer/ choreographer Luke Wiley, will perform on the Civic Theatre stage for one night only, Tuesday, Oct. 18, at 7:30 p.m. Parade, a two-act performance piece for two soloists, explores what happens when two artists who normally stand alone investigate the possibilities of poetic collaboration. At parts, the performance will make innovative use of the theatre's recently restored and enhanced theatre organ, and Civic looks forward to challenging some of the stereotypes of the instrument. Over the course of an evening, Carpenter, through the keyboards, and Wiley, dancing in a role that ranges from the balletic to the interpretive, move from solo performance through increasingly unified works. With musical influences ranging from Bach to Björk, Wiley and Carpenter offer a celebration of collaboration, and of art's ability to transcend borders of genre." Incidentally, Carpenter's on-line essay on music-education issues is totally worth reading, and totally right. Money quote: "The classical music community must demonstrate more flexibility, more spontaneity, and more adaptability than it has demonstrated thus far. Simply throwing up one's hands and exclaiming 'How can we compete with MTV?!' is ridiculous; one must get inside the minds of the audience one is trying to reach." On the following night, at the New York Public Library, Nico Muhly will unveil his musical adaptation of Strunk and White's Elements of Style. Unfortunately, I will miss both these events, on account of my journey to Iowa. Tony Tommasini, Justin Davidson, Mark Swed, and Alan Rich, among others, praised the score as is. Rich writes in LA Weekly: "The wonder of Doctor Atomic, overriding the timelessness of its subject matter and the intelligence in the way it has been set forth, is the deep penetration of Adams’s music into the troubled souls of his characters. More than in any large-scale work of his to date, I get the sense here of extraordinary mastery over a vast spread of expressive technique, and the intelligence to summon its variety at the proper moment. This is operatic writing in the grandest sense, the more so for it being entirely of its own time – and ours." That's my take, too. There are five more performances of Atomic, and tickets are becoming scarce. The score won't be heard again until 2007. The Red Sox may have fallen short this year, but the Boston Symphony's grand-slam all-American concert at Carnegie Hall last night made it official: they are once again, as they were decades ago, the champion American orchestra. Old Charles Ives would have fallen out of his chair to hear his music done as perfectly and passionately as the Bostonians played Three Places in New England. Lukas Foss and Elliott Carter were visibly dazzled by James Levine's renderings of their works (Time Cycle, with Dawn Upshaw, and the brand-new Three Illusions). The Gershwin Concerto in F, with Jean-Yves Thibaudet, was performed without condescension or apology, the grand jazzy tunes folded into a romantic-impressionistic whole. If a pianist can sound both fastidious and devil-may-care, Thibaudet managed the feat. In sum, this concert was wicked good. 1946 World Series ticket courtesy of long-suffering Red Sox fan Daphne Ross. It was given to her, believe it or not, by Leon Culberson. Peter Davis gives the New York Philharmonic a superlative that the marketing department will have a hard time using in the brochure: "the most boring major orchestra in the world." Let's be fair and add that it's a sensationally good boring orchestra.